Are You Calling Me YELLOW?!? The question is – is this rug WHITE to begin with? 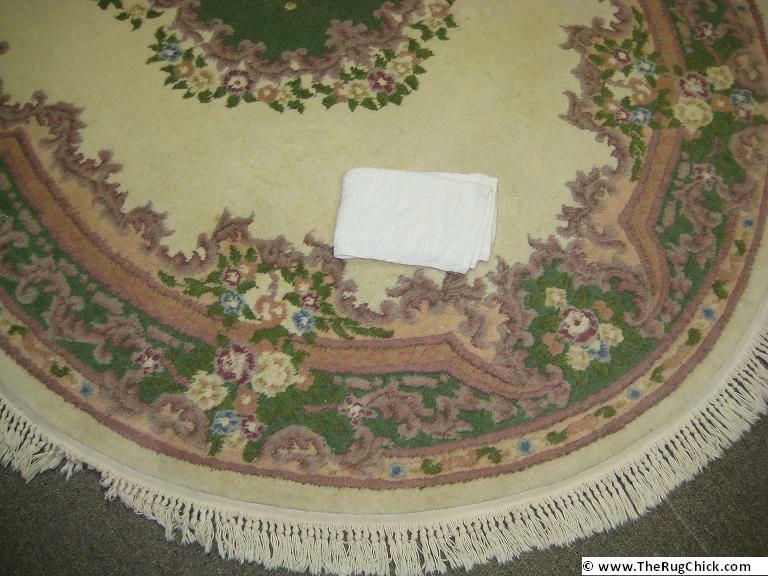 A white towel shows us the yellow of this rug. 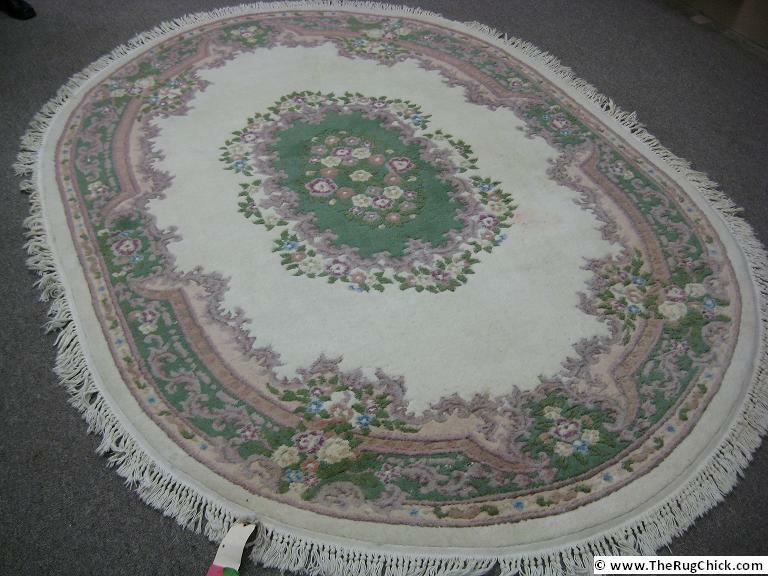 One of the dangers of seeking out white and ivory rugs is that they do have a tendency to YELLOW over time. Now, sometimes, improper cleaning (i.e. using the wrong cleaning solutions) can yellow a rug. If it is a result of the CLEANING then it would have the problem only on the front side of the rug because that is the side being cleaned. If the yellowing is from the environment (i.e. foot traffic and sunlight exposure), then again, this yellowing would be on the front side only because the back has not been walked on or placed in those UV rays. Comparing the back and the front of the rug. In this case, the back side IS yellowing the same as the front, so this is simply the effect of age to the wool used in this rug. Again, BRIGHT white is not a natural color of wool, so this process to make it more appealing for the buyer has the negative effect of turning yellow. Be sure to rotate the rug in the setting, as it can look more white from one direction versus the other. And just realize when you are shopping for rugs, that the white state can only be temporary with wool. It’s just the way it was made, and there is nothing wrong with the rug itself… and though professional cleaners may be able to lighten the look a touch with some oxidizers or reducing bleaches, these solutions (just like the original treatment) are chemical treatments that DO cause damage to those fibers. Some cleaners may refuse to do the work for fear of creating structural problems for the rug. I am not the biggest fan of TUFTED rugs. Simply because I appreciate the art of a woven rug crafted by hand,versus the mass-market production of tufts of wool held together by latex and covered up on the back with material. It’s cheaper to buy a tufted rug than woven, because of course the labor is a fraction of the time, but you also get what you pay for – a rug that lasts several years versus decades (or centuries) … a rug that is many times “disposable” because they simply do not last long. And definitely not a rug to hand down to your children. But maybe you don’t mind that. You might be looking for something that looks nice, and maybe you have pets so you don’t want an investment piece of art on your floor, so it may be that a tufted area rug is exactly perfect for your needs and budget. I can understand that. Some tufted rugs from India smell like dirty old socks and rubber. Tufted rugs from India are getting a reputation for smelling bad. There appears to be a flaw in the curing process of the latex holding the rug together that off-gases an awful smell. The purchaser may get a great deal on the rug and think that this can be washed to smell better – but they would be wrong, because the odor actually WORSENS with moisture. As of this date, none in my network has come up with a solution to this problem except to turn the rug away as uncleanable. 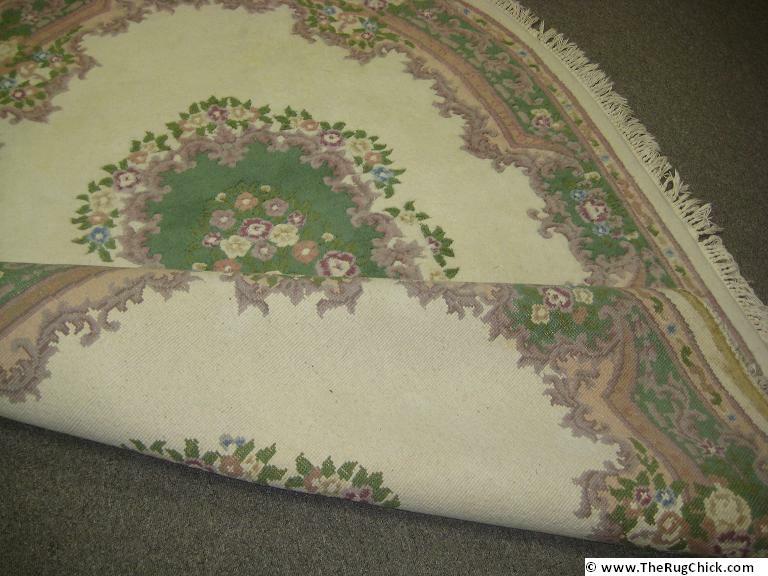 Some of these problem rugs have white material backing, and many I have seen have the blue backing shown in the photograph above. In my experience all have been from India, but not all India tufted rugs have this problem. And it may be that China or other countries produce tufted rugs with this particular problem, I just have not experienced it in anything other than tufted product from India. When you go to buy a tufted rug, you grin open the fibers in the store and you SMELL the rug. If you notice a strong blend of dirty old socks with old tire rubber, then you have a problem. Do not buy the rug. If you have recently bought a tufted rug, have closed up your house for a trip, and return to the strong pungent smell that makes your eyes water, then return the rug to the store. 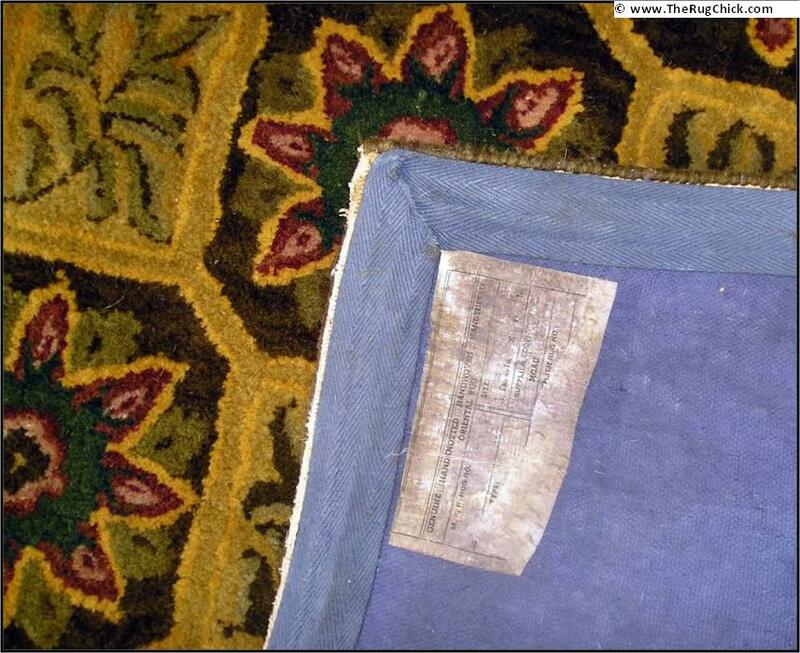 This is a manufacturing flaw, and the rug should be replaced. Then the retailer can ship it back to the factory and insist that they improve their manufacturing process. And if you don’t want to deal with any potential odor problems like this, then buy a rug that is woven and does not use latex or glue to hold it together because it has been crafted beautifully by hand and does not require any adhesive to keep it together.